Vacation rental condominium. Sleeps 14, 4 bedrooms, 3 bathrooms. No pets allowed. As you walk into “Sunkissed”, newly renovated with tropical décor, at Azure, you immediately have a Floridian beach feel! You are captivated by the panoramic 6th floor ocean view via the large patio, with glass doors spanning across the living area and master bedroom. The view of emerald blue waters breaking against sugar white sand beaches takes your breath away, especially at sunset! *Gulf Front Master Bedroom – A fabulous master suite with a great view of the beach and the sounds of the surf easing you to sleep! Sliding glass door for balcony access where you can enjoy your morning coffee or sunset cocktail. There is a king bed with beach inspired palm linens and warm colors to soothe you. There is a 27” TV, chest of drawers, chair with reading lamp, two night stands, alarm clock, and phone. You’ll enjoy the spacious master bath with separate walk in shower and 2 person Jacuzzi tub, granite counter tops with double sinks, linen closet, and private bathroom. There is even his and her closets. (Sleeps 2) *Guest Room 1 - Tommy Bahama decor with a Queen bed, warm colored linens, two nightstands, 27” TV and chest of drawers, dressing mirror, large closet and attached to large private bath tub/shower combo. There is also a phone and alarm clock. (Sleeps 2) *Guest Room 2 – Crisp and clean beach feel with a Queen bed, 19” TV with chest of drawers, a night stand, alarm clock, chair, and 2 large closets with private bath including a full size tub/shower combo and linen closet. (Sleeps 2) *Bunk Room – A kids dream! This custom made bunk room is all your kids need to see to choose “Sunkissed” as your next beach getaway! It features full size bunks with full pull out trundle and is able to accommodate 6 adults or kids. There is a flat panel 22” TV’s and DVD’s in each bunk with cable TV, nautical headboard lights in each bunk with cool touch bulbs and safety rails for the kids. There are bright and cheerful striped linens and the ocean blue walls with surf motif make this room a must see! (Sleeps 6) *Living Room – Casual but elegant décor with a large sofa and full size leather sofa sleeper, leather chair with large frieze area rug. There is a 55” LED/LCD wall mounted flat panel HDTV by Vizio, with state of the art Sony Home Theater system, including BluRay, CD, FM tuner, and internet apps such as; Pandora, YouTube, Netflix, and much more. Gulf front views, beautiful 9-foot ceilings with crown molding and gorgeous 18” diamond patterned floor tile from kitchen to door. A wall of floor to ceiling mirrors opens up this large floor plan even more. There is also a computer ready workstation with High Speed WiFi. (Sleeps 2) *Kitchen/Dining - A fully equipped gourmet kitchen with bar seating for four and separate dining area with seating for six more. Large 18” tile throughout, with beautiful diamond patterned tile backsplash above countertops and on back of breakfast bar. Granite countertops and stainless steel KitchenAid appliances with all essential small appliances and Maple cabinetry. we have stayed at this property before but not this unit. the unit was perfect for our needs bunk room for the kids and plenty of space for 8 adults. unit was beautiful view was awesome. Thanks for the great review. 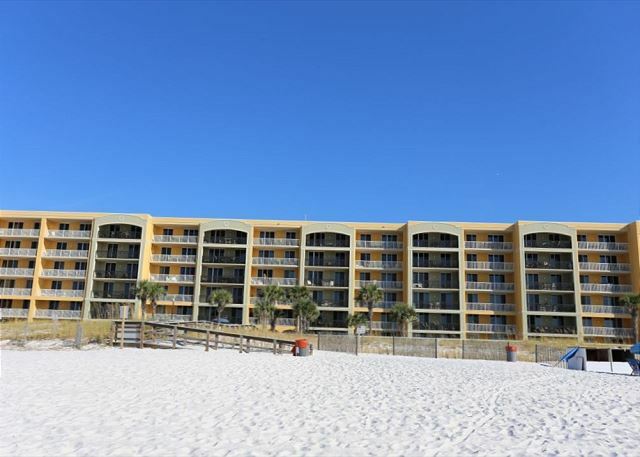 With this being a top floor unit it does have an amazing view over the dunes of the Okaloosa Island beach. Azure Sunkissed was wonderful. The unit was nicely decorated. The bedrooms and bathrooms were spacious and very clean. Kitchen and baths had beautiful granite counter tops and had everything we needed. We couldn't have been happier. A great location for dining and shopping. Highly recommend. Thanks for the review. We will hope to see you again next year. We loved the facility. Property was clean, easy walk to the beach. Nice pool. Loved it. Would definitely go back. The condo was absolutely perfect for our family of seven. It was pristine, comfortable, great view and we could not have wanted anything more. Thank you! Rocking the beach with "Cindy"
We have been coming to Okaloosa Island for 10 years. This was our first visit to Azure Condos. While the facility is large, it was easy to get in and out of the building. Our condo was lovely and large enough to accommodate our group. Loved the two large pools and splash pad. There were a couple of minor cleaning issues that we resolved ourselves but notified the owner afterwards so they would be aware. Overall, we had a great time, even though Cindy tried to derail the week but failed. I would recommend the property to others. The process in reserving the condo was easy with no problems. This condo, however, did not offer complimentary beach service for the time we were there which was a little disappointing. Great! Would definitely stay again! Azure was really nice...our family had a wonderful time!! We will definitely stay here again in the future!! Everything needed was in this home,very clean and in a great location. Had trouble with the balance part of the registration process,pymt system not working,no sheets provided for trundle bed,not enough towels for the number of people, toilet so low to ground felt like sitting on the floor. Condo was bigger than expected and very clean. The kitchen was stocked better than I could have imagined with the tools to cook for 8 people. Did use disposable plates and silverware because I didn't want to wash dishes all vacation. Appliances top-notch. Beds comfortable. Unit is quiet - no noise at all from outside unless doors open. Wi-Fi was virtually nonexistent - trade off for the quiet (thick walls). Access to beach and water was great - loved the key pad on the door so we didn't have to mess with keys. May want to bring a dolly or folding cart to bring up groceries or luggage if you check in at 4:30 on Saturday - had a tough time getting carts then but only then. 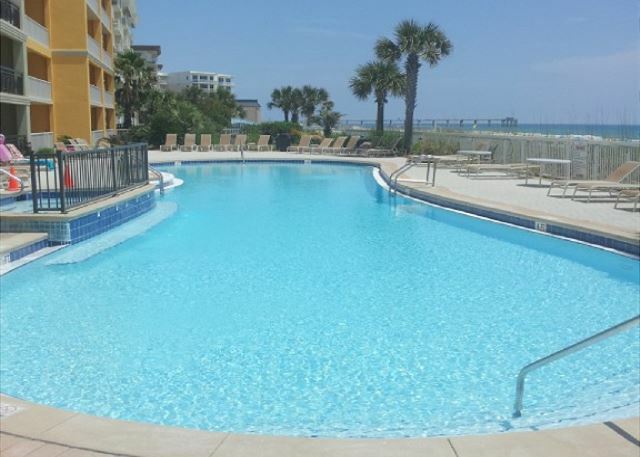 Would definitely come back to Ft. Walton and this condo - great trip was had by all. Overall we were very satisfied with the property. However, the mushroom water feature for the kids was not operating the entire stay and the wi-fi for the internet was VERY iffy if at all usable. The pool was very nice, but there were only about 4 tables in the pool area, none of which had umbrellas.